The days of the BMI are numbered, so it seems. Researchers at the Cedars-Sinai Medical Center in Los Angeles published a better method to determine how fat someone is: the RFM. If you use the RFM, weighing is no longer necessary. You only have to measure the circumference of your waist. And knowing your height. 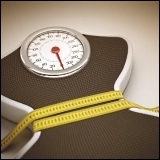 Scientists, physicians and sometimes also trainers still use the BMI to determine if someone is too fat. In general this method works, but in many instances it does not. We are not going to talk about it. A better way to determine how much body fat someone has, is to make DEXA scans. Measuring skin folds with clippers is a good second. But in practice there is a need for a less laborious and, above all, a faster way. The researchers wanted to find a simple formula that assesses the fat percentage, without having to do all sorts of difficult measurements and calculations. They used data from 12,581 Americans collected in the National Health and Nutrition Examination Survey [NHANES] to generate 365 formulas that could estimate how much fat someone has by using variables such as body weight, height and waist circumference. The researchers then released the formulas on a database of 3,456 Americans, and checked which formula gave the most accurate estimate. Below you see the most accurate formula: the RFM, which stands for relative fat mass. The result gives an estimate of the fat percentage. Height & waist circumference are expressed in meters, by the way. The figures below show that the RFM gives a more precise estimate of body fat percentage than the BMI does. The researchers looked at men and women, and at people from European, African and Latin American ethnicity. The RFM formula estimated the fat mass equally accurately for all groups. "We wanted to identify a more reliable, simple and inexpensive method to assess body fat percentage without using sophisticated equipment", says lead author Orison Woolcott in a press release. [sciencedaily.com August 27, 2018] "Our results confirmed the value of our new formula in a large number of subjects: relative fat mass [RFM] is a better measure of body fatness than many indices currently used in medicine and science, including the BMI." "The relative fat mass formula has now been validated in a large data base", adds research leader Richard Bergman. "It is a new index for measuring body fatness that can be easily accessible to health practitioners trying to treat overweight patients who often face serious health consequences like diabetes, high blood pressure and heart disease." Sci Rep. 2018 Jul 20;8(1):10980. Those spare tyres around the middle are even worse for men's androgen levels than we thought. If you're carrying around more kilos of fat than is good for you, you also have less testosterone circulating in your blood than Mother Nature intended. Part of the life-lengthening effect of caloric restriction is caused by the reduction in the amount of visceral fat that occurs as a result of following a strict low-calorie diet.